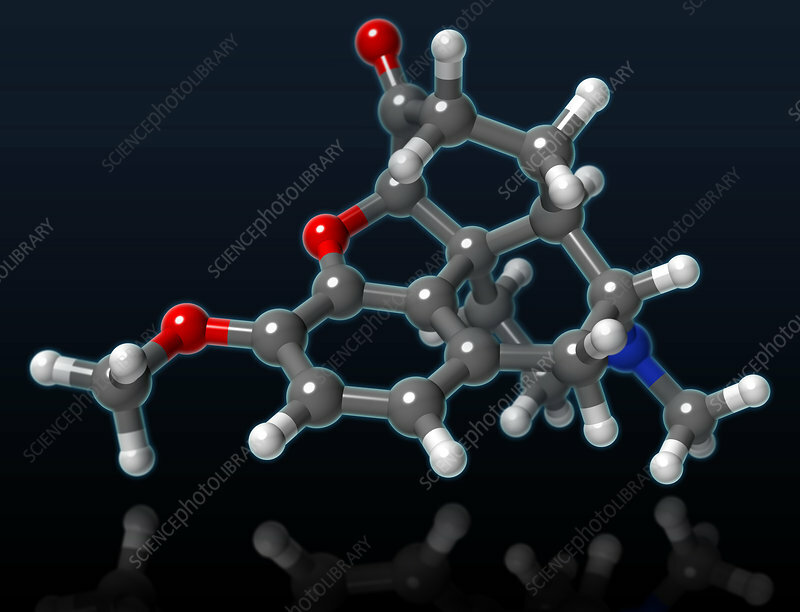 A molecular model of hydrocodone, a narcotic analgesic usually prescribed with other medications to treat moderate to severe pain. Combining hydrocodone with other pain-killers, such as ibuprofen or acetaminophen, is believed to reduce adverse side effects and be more effective in treating pain. Hydrocodone/acetaminophen (a.k.a. Vicodin) is one of the most commonly prescribed formulas in the United States. Atoms are coloured dark gray (carbon), light gray (hydrogen), red (oxygen) and blue (nitrogen).